Natural alternative to sugar - natural sweetness! I quit aspartame. Stevia is a healthier solution for me. I like to have my coffee in the mornings and be able to taste it like it is. Stevita let me have a coffee with the taste of coffee. BUT ...I tried to make the old fashioned cocoa on the Hershey's Cocoa box, like I have made for my kids over the years and it tasted just awful ! I'm sure I just needed to adjust the amount I used .... I thought I was going to have a low calorie version of this wonderful treat ! I haven't used the Stevita in anything else since that .... I will though . I think the product is good enough ,it's just to know how much to use . I cannot use Equal because it gives me a headache and I've noticed lately that if I use too much Splenda I get a funny feeling in my sinuses, so I decided to try Stevia. I had read about it several months ago as a healthy alternative to other artificial sweeteners, but I was hard to find because the government was trying to regulate it somehow. 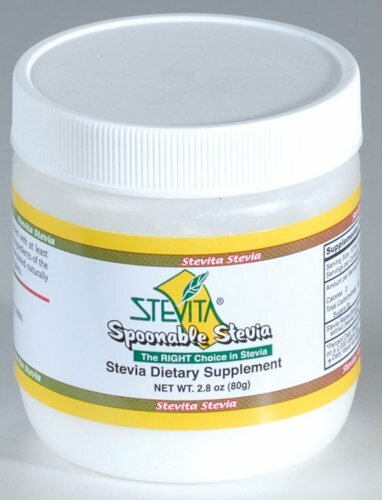 To date, I've tried Stevia in the Raw, which I like, Truvia, which is okay but not as sweet as the Stevia in the Raw, and Stevita Spoonable. The Stevita Spoonable is EXTREMELY strong and I cannot find an equal measures chart for it but as far as I can tell I use about 1/4 of a teaspoon for every 2 teaspoons of conventional sweetener (or 1 packet). I use it in tea with milk and love it! I haven't tried any baking or cooking with it yet.